Gubrud and linebacker Kurt Calhoun were arrested and jailed for obstruction following the incident in downtown Cheney. Both were suspended for this week’s game at North Dakota. Both are scheduled to appear in Cheney Municipal Court on Nov. 16 on charges of obstructing a public servant. According to the report, Gubrud and Calhoun attempted to interfere with the arrest of a friend, Spencer Payne, who allegedly damaged a railing on the property of the Mason Jar restaurant at the corner of First and F Street. While on foot patrol a few minutes after midnight on Sunday, officers Chad Eastep, Zebulon Campbell, David Bailey and Christopher Oakes observed a man later identified as Payne, 23, kicking and damaging a metal fence on the Mason Jar property. As officers attempted to arrest Payne, he resisted and also charged with obstructing a public servant. Meanwhile, a large crowd had gathered outside the restaurant, and two other officers arrived to assist. Despite the presence of several patrol vehicles, a man later identified as Calhoun walked onto the scene and demanded to know what was going on with his “homie,” according to the report. Calhoun, 22, later refused several requests to leave the area and said that he was “not leaving without his boy.” He was informed that he was deliberately hindering police effort to complete an investigation, officer Bailey reported. Calhoun was advised that he was under arrest for obstruction, a misdemeanor, and placed in handcuffs. Calhoun also smelled of alcohol and showed signs of intoxication, according to the report. Meanwhile, several other people moved into the crime scene and were asked to vacate. Only one man, later identified as Gubrud, refused the order. After telling officers that they would be sorry for their actions, Gubrud walked across F Street, then returned to the scene. He also refused to leave “until his boys were released,” even after being threatened with arrest for obstruction. Gubrud, 22, was handcuffed and advised of his right to counsel. 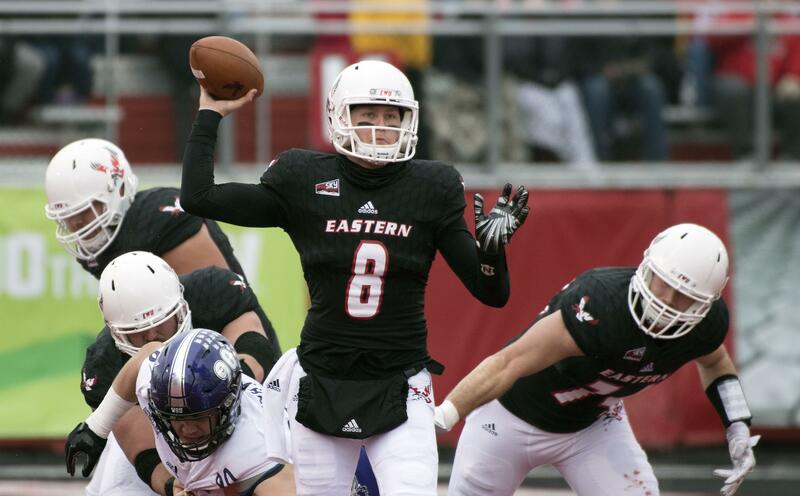 At that point, Bailey reported that Gubrud said several times that he was “the quarterback of the EWU football team” and used a vulgarity to describe the officers on the scene. Payne, Calhoun and Gubrud were later transported to the Cheney Police Department and placed in separate holding cells. While citations were issued, Calhoun and Payne fell down in the booking area because of their intoxication, the report continued. Calhoun’s head struck a metal door. Calhoun and Payne refused treatment. Later all three were released from custody. Gubrud and Calhoun have started every game this year for the 11th-ranked Eagles (5-4 overall, 4-2 in the Big Sky), who must win their final two games to have any chance of earning an at-large berth in the FCS playoffs. One of the top passers in the nation, Gubrud has thrown for 2,897 yards and 22 touchdowns and was a Walter Payton Award finalist last year as one of the outstanding FCS players in the nation. Calhoun, a junior from Zillah, Washington, was coming off a career-high performance for tackles with 13 in Saturday’s 28-20 loss to Weber State. Published: Nov. 7, 2017, 6:25 p.m. Updated: Nov. 7, 2017, 6:58 p.m.